After the procession comes the coronation as St Mirren got over the finishing line at the second time of asking to claim one of the most convincing Championship titles of modern times. 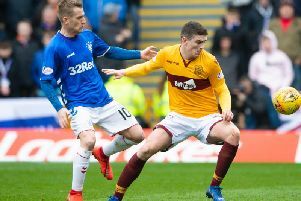 Livingston, their nearest rivals throughout most of the campaign, made them work for it, but even with the game a disappointing nervous stalemate the Buddies cemented a promotion after three years away. with even Sir Alex Ferguson, a former Saints promotion-winning manager, giving his endorsement to his old club’s success. There have been a few dissenting somewhat bitter sounding voices trying to detract from the achievements of the Paisley men who have been transformed in a short time from looking like relegation certainties to runaway winners who have not only done it with a margin, but with an arrogant swaggering saunter. League tables do not lie, and the Buddies have been by miles the best team in this division since January last year, and they thoroughly deserve to be taking their place back in the top flight. Certainly their manager, Jack Ross, could not contain his delight, nor his wide as the Clyde grin, as he lavished praise on his charges. He said: “We have the best players, the best squad and best team and this is why we are where we are. “From day one of pre-season training we set this target and we never lost sight of it. My first emotion is relief, but close behind is enormous pride and satisfaction in what this fantastic group of players have achieved which is something they can never have taken away from them. For all that they dominated the opening half, the Buddies gave off a jittery, nervous feel as they set about trying to give the massive home crowd what they craved. Had Lewis Morgan’s early strike not rebounded out from the inside of the post via the fingertips of Neil Alexander it could have been a very different story. Cammy Smith lobbed a shot over the bar and then narrowly failed to connect with a low centre as they pushed for the goal that their fans were praying for. Livingston offered mostly set-pieces, all fielded easily by Craig Samson and his defence. The second period was even tenser than the first, both teams being more concerned with not getting back with so much on the line for both camps. Livingston defended resolutely with block after block denying several forward thrusts by Saints and were like bees round a honeypot in their approach to shutting out the talents of Lewis Morgan. But it really didn’t matter as the Buddies claimed the title they have dominated almost from the off. Livingston manager David Hopkin was almost as happy as his counterpart with his team now assured of a play-off place. He said: “This is a massive point for us as we have now qualified for the play-offs, which for us on our budget is a tremendous accomplishment. “Congratulations to Jack Ross and his players, they have deserved to win this league, but on our budget what we have achieved is every bit as good. Most inside the Paisley 2021 Stadium will question his claim that Livingston’s achievement matches that of St Mirren, but only once the noise dies down and the beer stops flowing, not to mention the little matter of a presentation and a guard of honour next week when Morton come to town.